The Parga and Sivota Islands Cruise is the best way to experience the beautiful coast of Mainland Greece. Enter the breathtaking cave of Sivota. Swim and snorkel in the exotic turquoise waters of Blue Lagoon. Feast your eyes on the amazing landscapes of the Corfiot and the Mainland Greece coastline. Be prepared to take pictures! Dolphins might occur! 1. The boat stops inside the cave, where you will have the opportunity to take photographs. 2. The beaches of Parga are a five-minute walk from the city. 3. The boat moors close to the beach in Blue Lagoon. Camera (or video camera), waterproof camera, swimming suit, mask, towel, glasses, hat, comfortable shoes or sandals, a small bottle of water for the walking tour to the Venetian castle, high-factor sunscreen (recommended). 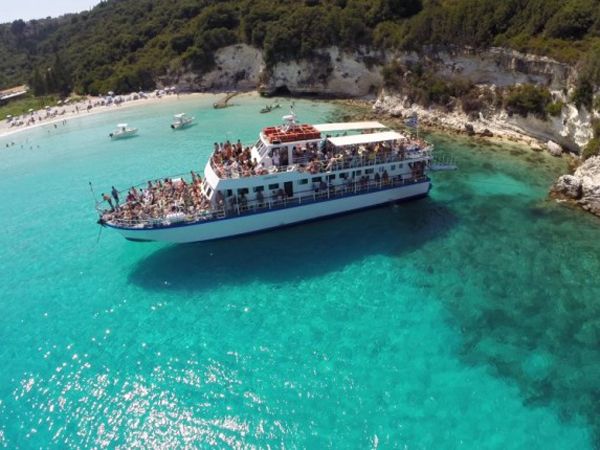 These three jewels of the Ionian Sea - the islands of Paxos and Antipaxos, situated close to the southern coast of Corfu, and the famous blue Caves of Paxos - offer a glimpse into the hidden, rugged beauty of the islands. 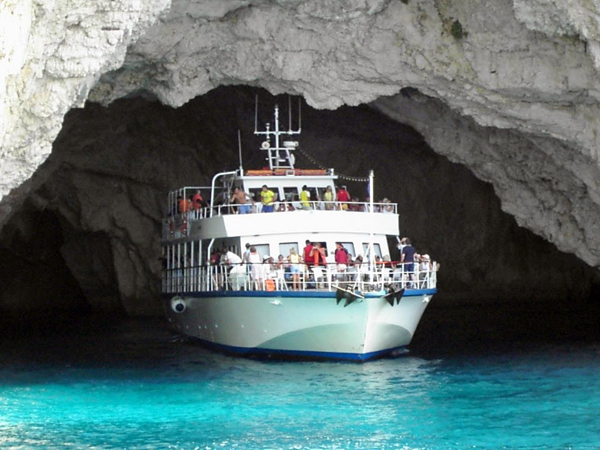 Enter in two of the breath taking Blue Caves of Paxos (Caves Ipapanti and Ahai). Admire the stunning white cliffs of Erimitis. See Ortolithos island and the natural wonder of Tripitos (Kamara). Enjoy your lunch at the sea view restaurants of Gaios village. meters away from the main square of Gaios village. c) The boat stops inside the caves, where you will have also the opportunity to take photographs. Camera (or video camera), waterproof camera, swimming suit, mask, towel, glasses, hat, comfortable shoes or sandals, high-factor sunscreen (recommended). Among Mainland Greece’s most beautiful features, the Sivota Islands are blessed with sun-soaked shores, sandy beaches, natural coves and fjords. 1. The beach of Sivota is a five-minute walk to the east of the village. 2. The boat stops inside the caves, where you will have the opportunity to take photographs. Our single-day cruise to the fascinating country of Albania is aimed at adventurous travellers seeking something out of the ordinary. Explore the ancient city of Butrint and the Museum. Amazing landscape view of the Corfiot and Albanian coastline. 1. This full day cruise is not recommended for elderly people or families with young children. 2. Duty Free is available at the Port of Corfu. (Please pay attention to restrictions listed at the Customs Office at the Port of Corfu regarding goods declaration). 3. For citizens of an EU country a valid ID-card or a valid passport is required on the day of travel. Citizens of a non-European country subject to visa obligation in the Schengen zone need a valid passport and a residence permit or visa of the country belonging to the Schengen zone. Citizens of a non-European country subject to visa obligation in the Schengen zone need a valid passport and multi-visa if the wish to travel from Greece to Albania and return. 4. Children under the age of 18 are not accepted on board without being accompanied by the two parents. Children being accompanied only by one parent, the other parent must sign a written authorization. If the adult is not one of the two parents either parents or legal guardian must sign a written authorization. Join us and explore Mainland Albania – a truly magical place! 1. Duty Free is available at the Port of Corfu. (Please pay attention to restrictions listed at the Customs Office at the Port of Corfu regarding goods declaration). 2. For citizens of an EU a valid ID-card or a valid passport is required on the day of travel. Citizens of a non-European country subject to visa obligation in the Schengen zone need a valid passport and a residence permit or visa of the country belonging to the Schengen zone. Citizens of a non-European country subject to visa obligation in the Schengen zone need a valid passport and multi-visa if the wish to travel from Greece to Albania and return. 3. Children under the age of 18 are not accepted on board without being accompanied by the two parents. Children being accompanied only by one parent, the other parent must sign a written authorization. If the adult is not one of the two parents either parents or legal guardian must sign a written authorization. 1. 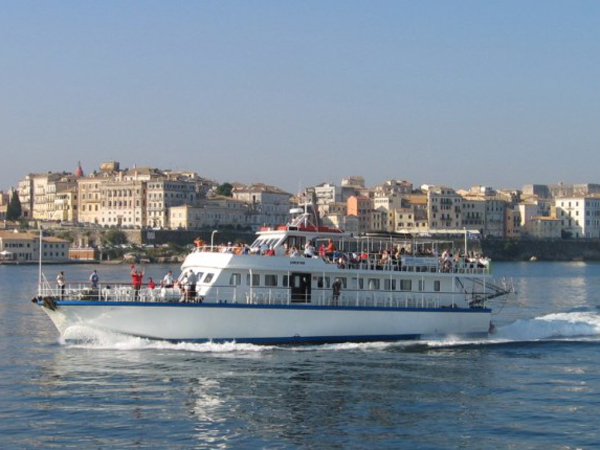 Our company provides coach transfers to and from the hotel and the main Port of Corfu. 3. 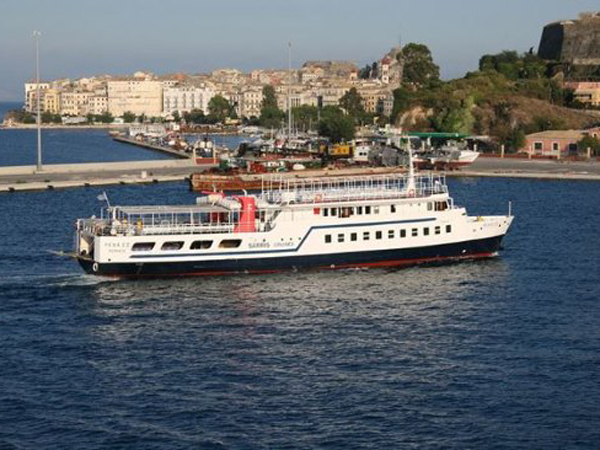 The Ionian Cruises Customer Service phone number is available for the morning coach transfer (+30 6973342026). 3. There is parking area in the Port of Corfu. (3 euros for 24 hours). 4. On-board facilities: 2 open decks with seated viewing areas, air-conditioned main hall, TV, DVD player, music system, self-service bar, toilets, showers, cabins and changing areas. 5. The bar offers a variety of coffees, alcoholic beverages, refreshments, juices, toasts, sandwiches, pizzas, croissants and several other snacks. 9. Children must be accompanied by an adult. 10.The departure time is subject to slight change according to local traffic conditions. We look forward to meeting you on board one of our ships.